On 3rd and 4th September 2005, a specially selected group of dedicated, advanced club members took part in a weekend of fun and training. It all began with a session of Judo training, fitness training and fitness tips from Danny, who set us all a task of doing a 1 mile run every week, eating fish and chicken (or at least a type of protein) everyday, and keeping a food diary of everything we eat. 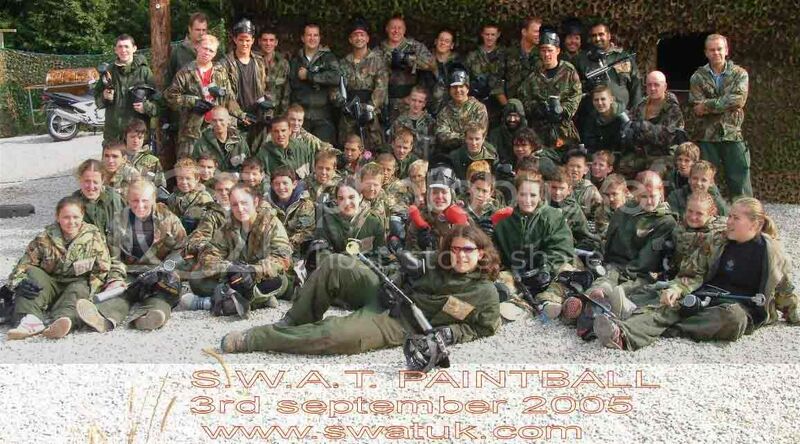 After that we all went off to do paintballing (see if you can spot us all below). Thanks to Anthony Daly who wrote the report below. After paintballing we went back to Chris's for pizza and to stay the night. The next day we went the Multi-Regional judo training session in Wolverhampton. On Saturday the 3rd of September 05 Wirral Judo Clubs� advanced class visited S.W.A.T. Paint-balling site situated in Parkgate. The day started with all of us getting �kitted-up� in combat gear i.e. mask, gloves, jacket, pants etc. Then we were sorted into two teams. red and white with roughly twenty people in each I was in the red team along with Richie, Matty, Eve, Hannah, Duncan and Chris to name but a few. We were taken through the safety procedure then we had two fifteen minute games which were a small battle and the whites attacking the reds fort. We then had lunch which Charlotte really enjoyed. It even gave Duncan enough time to re-gel his quiff seens as his mask had flattened it. We then had four more games (capture the flag, capture the hostage and assaulting each others base). Chris even persuaded the fella in charge to give our club an extra game. I even won a free voucher for shooting everything. We all had a great day and an even better one the next day at a really easy training session in Wolverhampton!! !